Thanks Jon and Dart, for the comments! 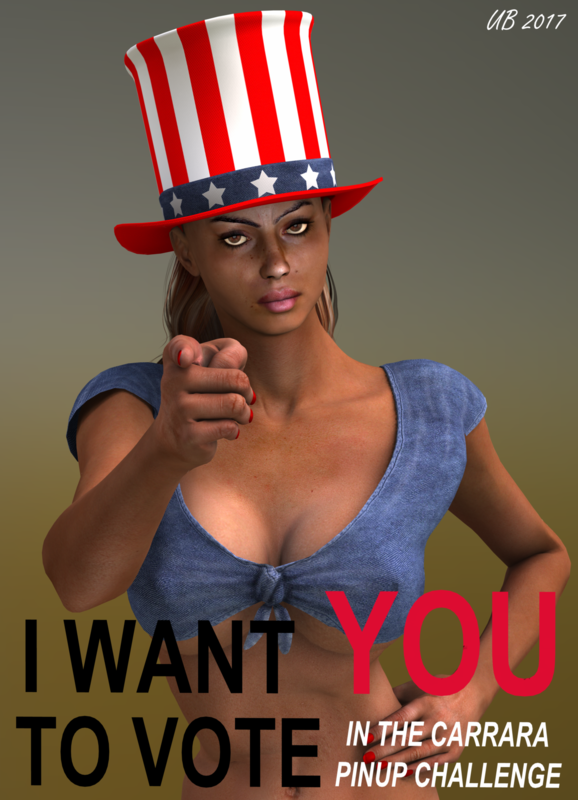 The vote render is V3 with a Horo HDRI. UB - the vote render looks awesome - could easily have been an entry - and V3? She's never looked so good! UunifiedBrain - Agree with everyone, that is a wonderful vote image. There is a thread in the Art Studio forum dedicated to the older generation figures. I'm sure those folks would love to see what you have done with Vicki. Thanks HW, Phil and Diomede! Phil, you had mentioned earlier that you were shocked that I had never used an HDRI. So I figured that I had better get cracking. Diomede, thanks for the link. I will definitely read that oldie thread when I have time. Most of my character purchases these days center on generation 3. I think that joints are better in newer generations, but now that I can tweak joints in the modeling room, I'm not seeing the urgency of moving to later generation characters. For me, there is still a lot to learn in the earlier stuff. Additionally, lower resources + very few crashes make me a happy camper. UnifiedBrain, this is an incredibly awesome image! I've never seen V3 before and she looks great! I installed Studio in 2015 (Carrara was installed in April 2015), so my first figures were Genesis and Genesis 2. And now I'm trying to save anything from 2T of content from my dying hard drive. Then I will have to reinstall the system and all the programs. Thank you Vyusur and Magaremoto! Vyusur, I know that you are picky about joints, so be aware that if you use V3, you will sometimes have to tweak her in the modeling room. Not really that big of deal though. Doesn't V3 come standard in Daz studio? Also sorry to hear of your hard drive troubles (from bitter experience). Hope you get it sorted out soon. The good news is that you can't ever lose a Daz product, as they keep all your purchases on file. In that regard, they are awesome. Nope, V3 is sold separately - though I got her as a Free purchase way back when. She friggin rocked my (Poser) World back then. I have a cloud backup system called LiveDrive which has saved an awful lot of heartache and rework when I had a major computer failure about 2 years ago. It's not free but is worth it for the piece of mind. V3 was the current generation of Daz figure when I started using Poser and you can still see my poor efforts in the early pages of my Rendo gallery! I remember rendering V4 for the first time. Ah, how times have moved on. UnifiedBrain, Dart, Phil, thank you for your support! Now all my “White Swans” and other recent Carrara works exist only on this forum's pages. It's only a couple days more... then you may go nuts with it!!! Vyusur - I hope you don't mean that you lost the original scenes? I know you were recovering stuff from your hard drive. Phil, exactly! I've not saved the recent original scenes. I have a cloud storage for several GB and use it sometimes. But all my recent originals are lost. Oh no! So sorry for you. Such wonderful material. Wow. That's a lot of work down the drain... so sorry to hear, Vyusur! I have a lot of sympathy for you, I know what that can be like. I hope you can recover and rebuild most of what you need very soon. Diomede, Dart, Phil, thank you for your kind words! I write this message from my new HD. My two previous ones are completely dead. But I'm lucky to have a couple of my WIPs saved. I found them on my simple flash drive and those WIPs will be the ones I will start my next work from.